American Generic Labs BerryThin 60 Capsules is the latest weight loss product on the market and is backed by a 100% money back guarantee. Raspberry Ketones (250 mg) Plus African Mango. BerryThin from American Generic Labs is the latest weight loss product on the market and is backed by a 100% money back guarantee. The main ingredient is Raspberry Ketone which was made popular by Dr. Oz due to its ability to shrink fat cells and promote weight loss naturally. The weight loss secret can be traced to the fat and sugar regulating hormone, adiponectin, which is naturally occuring within humans. Raspberry Ketones increase the levels of adiponectin. BerryThin contains Raspberry Ketones, which are naturall extracted from Red Raspberries. In order to ingest the ammount of Adiponectin needed daily to stimulate weight loss, one would need to eat roughly 90-250 Red Raspberries per dose (2 daily doses are reccomended, of 100-200mg each). Luckily, the makers of BerryThin packed in a whopping 250 mg of Raspberry Ketones per serving! This powerful energy and diet formul also contains the popular African Mango, which studies have shown can help lower bad cholesterol and blood sugar while promoting weight loss. Green Tea and Apple Cider Vinegar are also added in a propietary formula to enhance the weight loss effects of this product. Men and women around the word are raving about the positive effects BerryThin has on diet, weight loss and overall wellness. 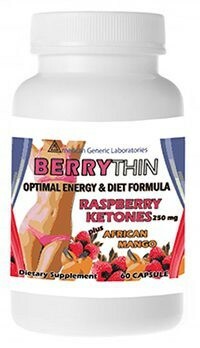 American Generic Labs, the trusted manufacturers of the popular MetaboThin and Superdrine-RX are proud to present you BerryThin, our best selling raspberry ketone dietary supplement with African Mango and a powerful blend to provide hours of energy throughout the day. If you are looking to lose 5, 10, or even 20 pounds or more then adding BerryThin to your daily diet can help! • Increases your energy levels and keeps you going all day! Take one Capsules 30 minutes priot to eating breakfast and another 30 minutes prior to lunch for a steady flow of energy and fat crushing power. Some people also prefer to take two capsules in the morning for an eye opening morning rush!